Josef Kaufmann Racing’s Kevin Jörg grabbed his first ever racecar victory in style this morning. Jörg led the 14-lap distance, maintaining a reasonable gap ahead if Louis Deletraz and Steijn Schothorst. The Swiss racer held a fearsome Deletraz off on the approach to the Rettifilo chicane on the opening, while Schothorst sat under Deletraz’ wing in the hope of following through. Jörg, however, held steady and maintained a nose of a lead as the tight chicane unfolded, eventually pulling out a gap of six-tenths come the end of the opening tour. The gap bobble in and around half-a-second for several laps, until Jörg began to break away from Deletraz after five laps. For Deletraz, the pressure was been felt from behind. Unable to filter through on the opening tour, Schothorst clung to the rear of Deletraz and refused to let go for several laps, pushing his Swiss rival to the limit. Deletraz finally broke Schothorst in the second half of the race thanks to a series of circulations in the 1’49s margin, while Schothorst held steady in the 1’50s throughout the race. 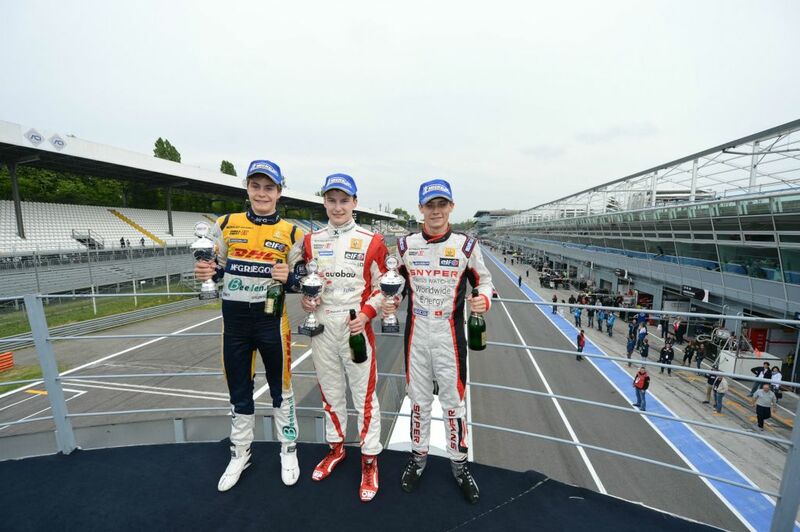 As the race reached its final stages, Deletraz had lost a further two seconds to Jörg, ensuring the 18-year-old would finally claim his first success after 66 attempts. For Deletraz and Schothorst, the pairing added to their solid results from yesterday, giving Deletraz 54 points and a ten-point advantage over Jörg going into the next round at Silverstone. A stellar start and some mid-pack madness helped give Ben Barnicoat a respectable 4th place. The Briton started 13th in his Fortec machine, only for Barnicoat to emerge from the opening tour in 6th following chaotic scenes. From there, Barnicoat took Andrea Pizzitola (lap 2) and Alexander Albon, the latter of whom pitted on lap 9. Pizzitola followed home in 5th position, ahead of Raoul Owens (6th), Mathew Graham (7th), Seb Morris (8th), Gregor Ramsey (9th) and Josef Zaruba (10th). Ukyo Sasahara removed himself from the action with a silly accident at the Ascari chicane on the opening lap.